This is one of a series of articles from our new feature ‘Background briefing: The Divided Island‘. It is a comprehensive interactive information guide on the Cyprus problem which we are publishing at this critical moment in the settlement negotiations. There is a menu bar to the full package to the right of this article. Just click on any of the items. This exclusive video shows Nicosia International Airport as it is today: chained and padlocked, strewn with razor wire, windows pierced by bullets. Once the island’s only international airport, it is a now a battered time capsule from 1974, a potent symbol of the island’s division. Yet when the new terminal building opened in 1968 it was hailed for the stylish modernity of its design. It was elegant and uncluttered with shafts of sunlight streaming through large circular wells in the ceiling. It oozed optimism. Six years later the airport’s effective service life was abruptly ended by the Turkish invasion. It became a UN protected area, situated in the buffer zone on the western edge of Nicosia. The sprawling airport area is Unficyp’s headquarters and active UN helicopters are based there. It is also used as one of the sites for inter-communal peace talks. The Turkish invasion left Cyprus struggling without air links for six months, virtually isolated from the world until each side dusted off former RAF airfields to replace the role played by Nicosia airport. 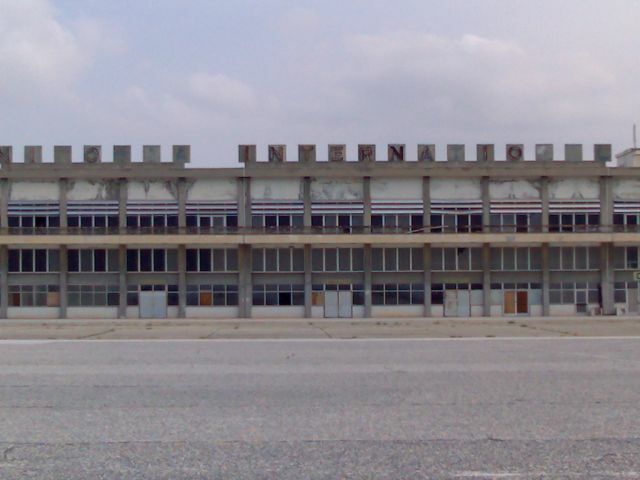 Larnaka airport, abandoned in 1948, was hurriedly overhauled and re-opened. Pafos International Airport was inaugurated in 1983 and Larnaka’s new airport began operating in 2009. The Turkish Cypriots re-opened Tymbou airport in early 1975 and called it Ercan. It was originally built during World War II for the RAF, abandoned when Nicosia airport re-opened for commercial use after the war, and then briefly used again during the 1956 Suez crisis for the RAF and the French air force to supply troops in Egypt. Re-opening Nicosia airport featured prominently in various UN-facilitated initiatives over the decades. The aim was to build confidence between the island’s two communities. Glafcos Clerides and Rauf Denktash appeared close to an agreement in 1994 that would have opened the airport in return for Turkey handing back the ghost town of Varosha to its original Greek Cypriot inhabitants. Nicosia International Airport has a short but rich history. Built for the RAF in the 1930s with its landing strip constructed in 1939, Nicosia was the island’s principal airport although initially it served mainly as a military one. Its runway and facilities were expanded during World War II and American bombers used the runway in 1943–1944 when returning from the allied bombings of oil fields in Romania. Commercial services resumed after the war and by 1948 Cyprus Airways and BOAC, among others, provided regular flights. The first terminal building opened in May 1949 and was extended 10 years later. During the 1956 Suez Crisis, Britain and France used the airport as a support and supply base for their offensive against Egypt. When Cyprus gained independence from Britain in 1960, Nicosia was the island’s only commercial airport and was handed over to the Cyprus government. The RAF, which had retained a site at the airport, continued to use it for military flights. RAF experts staffed the control tower while Cypriots who began immediate training to take over did so in 1963 and 1964. By 1966 it became impossible for the RAF to use the airport because of increasing pressure from ever-growing civilian traffic. The British base at Akrotiri on the southern coast now became the sole RAF flying station left in Cyprus and was in effect the only means of projecting British airpower in the eastern Mediterranean, other than aircraft carriers. A new, German-designed and Cypriot-built terminal opened in 1968. But with increasing numbers of holidaymakers flying in to Nicosia airport on Cyprus Airways and other carriers, plans were announced in June 1974 to expand the terminal and platform yet again. War shattered those plans within a month. But first came a Greek-inspired military coup on July 15, 1974 when the airport was closed for three days. When it re-opened on July 18, it was thronged with holidaymakers and other foreign nationals trying to leave the island on flights hastily arranged to evacuate them. The airport’s effective service life ended abruptly two days later on July 20 when Turkey invaded. The last Cyprus Airways plane had touched down just hours earlier – and was destroyed the same morning when Turkey launched a series of raids on the airport, which became the scene of heavy fighting between the Cyprus National Guard and Turkish forces. When this became particularly intense on July 23, the commander of the UN’s peacekeeping force in Cyprus, Unficyp, ordered his men to take over the airport, declaring it a United Nations Protected Area. A UN-mediated ceasefire was agreed but soon violated by tank-backed Turkish forces who were still determined to seize the airport. Britain warned it would retaliate if Turkish forces attacked and in a show of resolve flew 12 Phantom jets to RAF Akrotiri primed for combat. Turkey promptly backed down. Harold Wilson, the British prime minister at the time, later wrote that Britain had come “within an hour of war” with Turkey. Today, a forlorn and battle-scarred Cyprus Airways Hawker Siddeley Trident passenger jet sits alone in a corner of the sprawling airfield. Its engines were cannibalised after the invasion to fix another two other Cyprus Airways Tridents. They flew out of Nicosia in 1977 and were the last commercial flights from the capital’s once proud airport.